Fort William travelled down the A82 from the Highlands to sunny Yoker, Glasgow, to face Glasgow Mid Argyll. The visitors quickly raced to a two-goal lead with strikes from myself, before the GMA team fought their way back into the match, scoring just before half-time through Ben Dalgetty. GMA's Craig Anderson then levelled the tie minutes into the second half, which kept all things square, until five minutes before full time, when Chris Bamber lobbed in a high ball and I managed to flick it over my head past the keeper. This wasn't instantly confirmed, as the GMA players protested that the ball had not crossed the line, however the goal judge was adamant from the off that the ball had crossed the line and the winning goal stood. Another call for shinty goal-line technology! I jest. A great game and one where the game really could have swung either way at the end, however devastating for young Jamie Cruickshank who took a stick to the hand during the first half with his finger at first glance just looking dislocated. Accidents happen in shinty, however when a stick is involved then quite often more damage can be done than first suspected. Jamie sustained six fractures to his hand and needed an operation to insert wires and pins into his left hand to hold it together. Spending his 20th birthday and five days in Glasgow's Royal infirmary, it's never the news any of us want to hear and I'm sure like myself, everyone in shinty wishes him a speedy recovery. I have been trying to persuade all the young players to keep wearing their helmets and faceguards for protection, there's no harm in throwing in a couple of gloves to protect the ole digits also, before it's too late. The big shock of the weekend came in the Premiership where unbeaten league leaders Lovat travelled down the hill to Glenurquhart and lost 2-1, meanwhile league champions Newtonmore closed the gap at the top of the division with a 5-2 win over local Badenoch rivals, Kingussie. Lovat have never won the Premiership, and having beaten Newtonmore already this season, the gap now closes at the top, with More having a game in hand to nestle in joint top. This will not be the last we'll be hearing of this two-horse race. 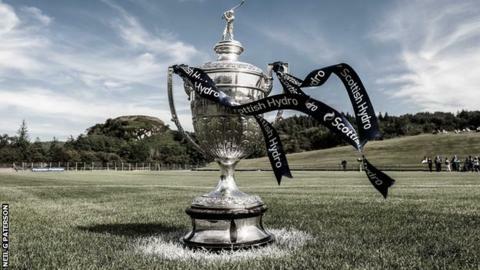 It's the first Lochaber derby of the year this weekend, when Fort William's travel arrangements consist of just a hop and skip over the river Lochy to Caol, where they take on local rivals Kilmallie. Both Kilmallie and Fort at the start of the 2014 season were tipped favourites to win the new National Division. However, for various reasons, Fort William head in to this crucial match a number of key players short. Not ideal with such a big match ahead but this will be a great experience for the younger players coming through to be involved with such a high-pressured game at the Canal Parks. I myself am in Spain with my band and miss the tie, however I will be keeping up to date with all the live scores online.